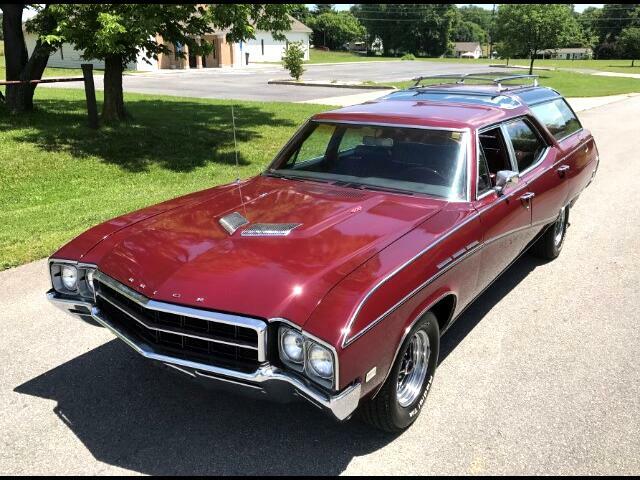 This is a very rare 1969 Buick Skylark Sport Wagon. It has the Buick 400 cu in engine, automatic transmission, power steering, power brakes, power windows, power door locks, power seat, factory air conditioning, 3rd seat option, Buick Sport Wheels, Full tinted glass, Dual opening tailgate, luggage rack and more.. This car also has the 400 cu in engine with the domed hood and special air cleaner. This is a solid southern car, that runs and drives very good, with nice straight body panels, and no rust. These are very rare wagons, as they have the glass roof panels, like the Oldsmobile Vista Cruiser wagon. Message: Thought you might be interested in this 1969 Buick Sport Wagon.